In addition to Blurmax wonderful post and pics, here the official results, hopefully an inspiration for some Japan members to go there and run. 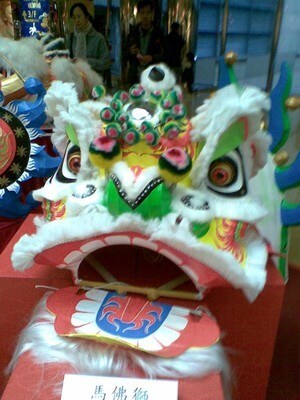 I found very few western names among the participants, maybe they are not into Chinese New Year. Today, I ran 10K at Shinjuku half marathon. It started 12:20 and weather was perfect. Sunny and warm, no wind. We ran 4 laps around Kokuritsu Kyogijou. It was very crowdy at the beginning, but overall, nice course. Yoko Shibui won today's Osaka Ladies' Marathon in 2:23:42 ahead of Yukiko Akaba and two Namban Ladies (in a distance). Veteran Lydia Simon finished in a respectable 5th position in 2:27:14. Rie Onodera unfortunately could not finish the race. Katarina Janosikova, who practiced with us when she was in Tokyo, ran 2:42:57 for 18th women in the NYC Marathon! Great result for her first try on the distance, we are waiting for more to come! Detailed story here! Tamami Koike won the open womens division of the Melbourne/ Coburg 6Km Fun Run on Sunday. Another pb.Her first win. ImpressiveTrophy. I got through the race without further injury...thats my trophy. Namban Rengo won two divisions and placed in another one for one of the most successful Shibuya Ekiden in hte clubs history. Detailed results will follow. Mika Tokairin, today's flying organizer! The ladies receiving their first prize! The masters celebrating their win. 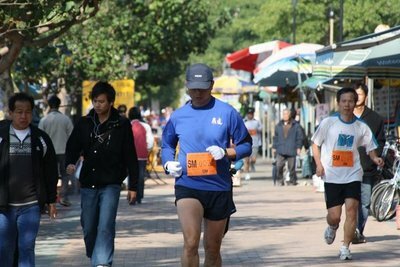 I participate to the Chiba Marine Half Marathon for the first time. It's a windy, popular and almost flat course. About 8000 runners took part in the Half Marathon. 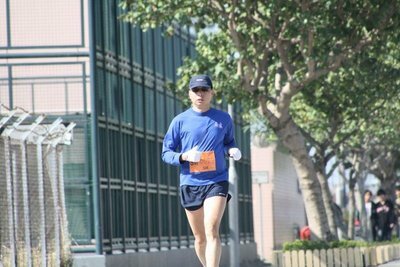 I'm training for Tokyo marathon and wanted to assess the results of the first two months of preparation. I had new PBs for 15k, 20k and half marathon by 24", 3'11 and 3"03. The wind woke up at 12k, a freezing reminder that we still in mid winter. A good day out there. Tamami-san and I raced over 2km on the track last night in Melbourne. in 36 degree heat. I managed 4th in 8.04 and Mi-chan (first women) got her 3rd PB in 7 days in 9.05. Very Interesting conditions! 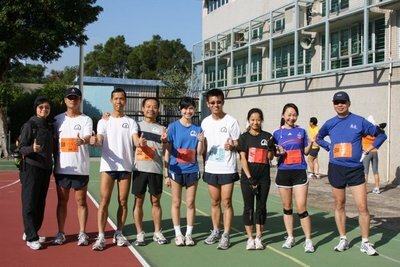 I completed the Cheung Chau RTI 10 K Race 2009 ( 第八屆 中銀 長洲元旦 環島越野賽 ) in the sightly cool morning today. Due to frequent races lately, I could only complete the race in a moderate slow time of 57 mins. I could not help from walking at those long uphill routes which making my speed much slower. As every year, this race was held in Gunma north of Tokyo. As opposed to the more famous Hakone Ekiden it is only a one day event featuring corporate teams, promising a bit of drama this year as favourites Konica-Minolta had been beaten by Honda in the preliminaries. The course has seven legs and is 100k long.